From 1927 to 2003, Mail Rail transported huge volumes of post under the streets of London, beneath the feet of millions of blissfully unaware commuters and tradesmen going about their daily business 70 feet above. Opened in an age when the horse and cart ran alongside new-fangled automobiles, it was a technological innovation that kept people in touch across ever-greater distances and at ever-greater speed. Since the last shift when workers downed their tools in 2003, the Mail Rail has sat, silently gathering dust. Until now! 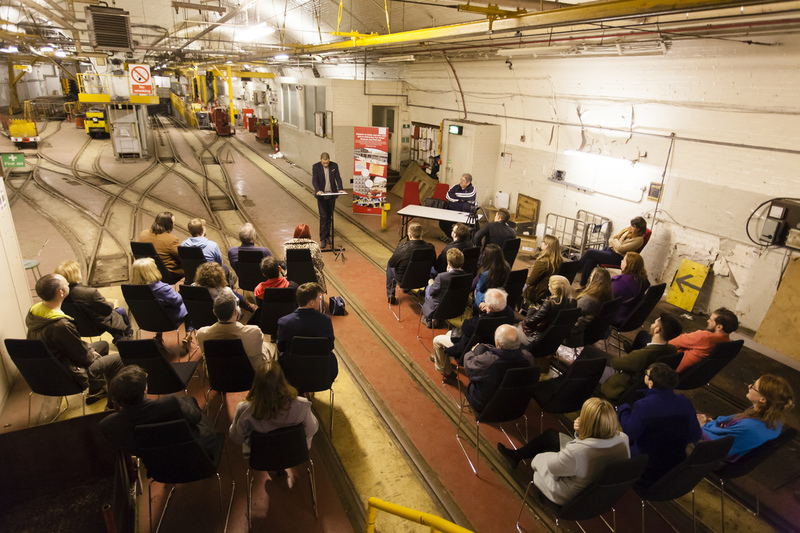 On 25 March, a lucky group of visitors were granted access to this hidden landmark as the Mail Rail Car Depot, where trains from across the network were brought for repair, became the dramatic backdrop for a very special BPMA event. 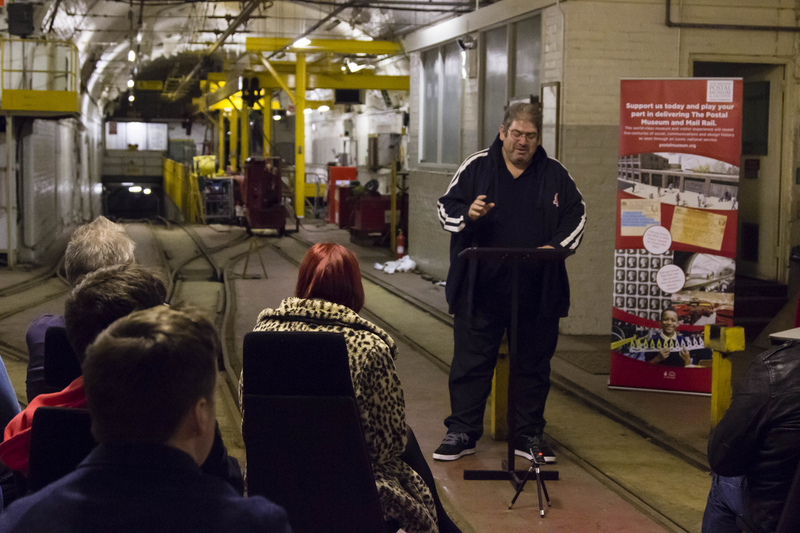 In collaboration with Cityread London 2015, an annual celebration that encourages all of London to pick up the same book and read it together, Ben Aaronovitch, author of the Sunday Times best-selling urban fantasy/crime fiction series Rivers of London, unveiled a special new short story, King of the Rats, read by comedian, rapper and entertainer Doc Brown, aka Ben Bailey Smith. 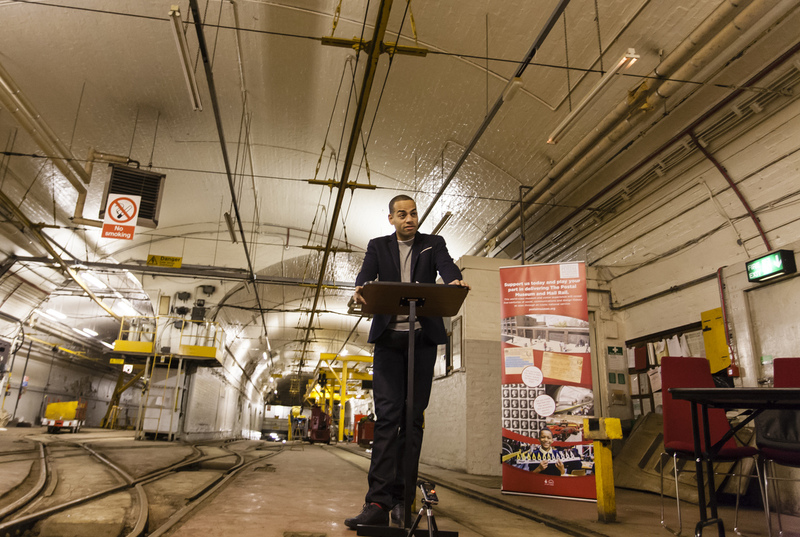 Ben Bailey Smith, aka Doc Brown reads a short story by Ben Aaranovitch, ‘King of the Rats’. “When a self-styled King of the Rats crashes a corporate do hosted by Fleet and Tyburn naturally the Folly are called in. Peter and Kumar have to determine whether his majesty is the legitimate ruler of the rat nation or a sad man with a rodent fixation. After being treated to this new instalment, fans were able to pick the author’s brain during a lively Q&A session! Ben Aaranovitch answers questions from the audience. The evening marked the start of Cityread’s 2015 season. Over the next month Rivers of London will be the theme behind a programme of exciting events across all 33 London boroughs. Asking a Curator to choose their favourite object is like putting a kid in a sweet shop and then telling them they can only have one! In fact, some of you may remember that I shared my favourite object with you last year, a truncheon issued to Post Office employees before the Chartist riots of 1848. Today however my favourite object is a recent acquisition of a Postman’s Hand, which is not quite as sinister as it sounds, I promise! Besides all the pun based opportunities this object has provided (for the last few weeks I have been constantly asking my colleagues if they need a hand with anything…) it is actually a very important addition to the BPMA’s collection, as it reveals an often hidden aspect of history. 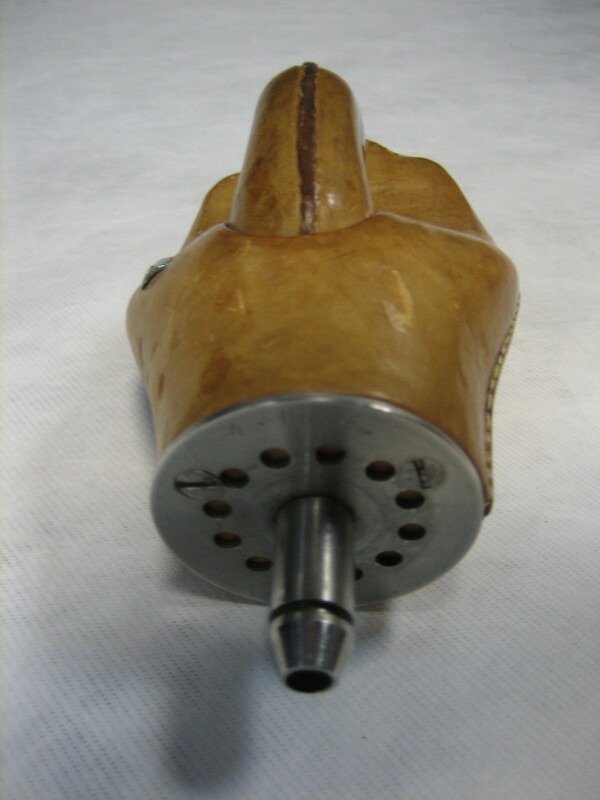 The hand in question is not a real one but is made of wood covered with leather and has an adaptor to fit it into the wrist unit of a prosthetic arm. 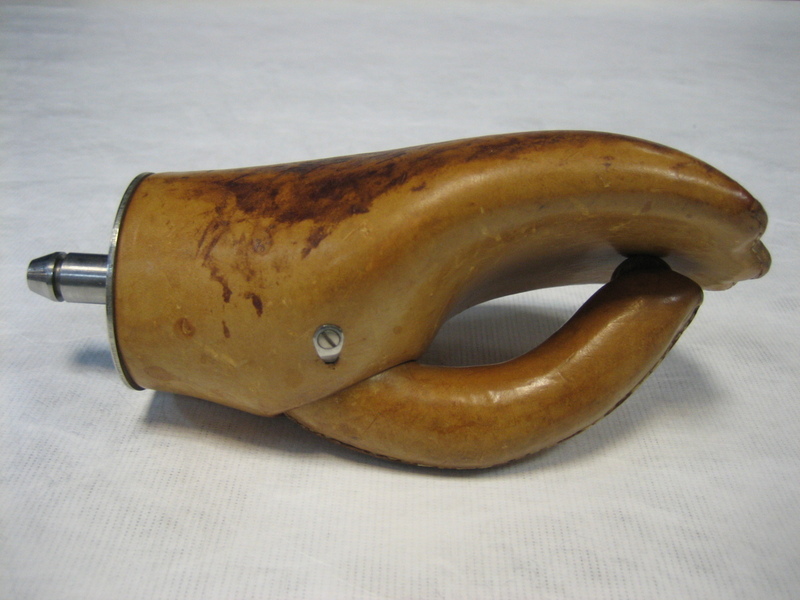 Some of the earliest prosthetics in history were also made of wood and leather but this hand fits into the advanced development of prosthetic limbs that occurred after the Second World War to aid rehabilitation of the many soldiers who had limbs amputated as a result of the conflict. Postman’s hand on adaptor to fit a prosthetic arm. 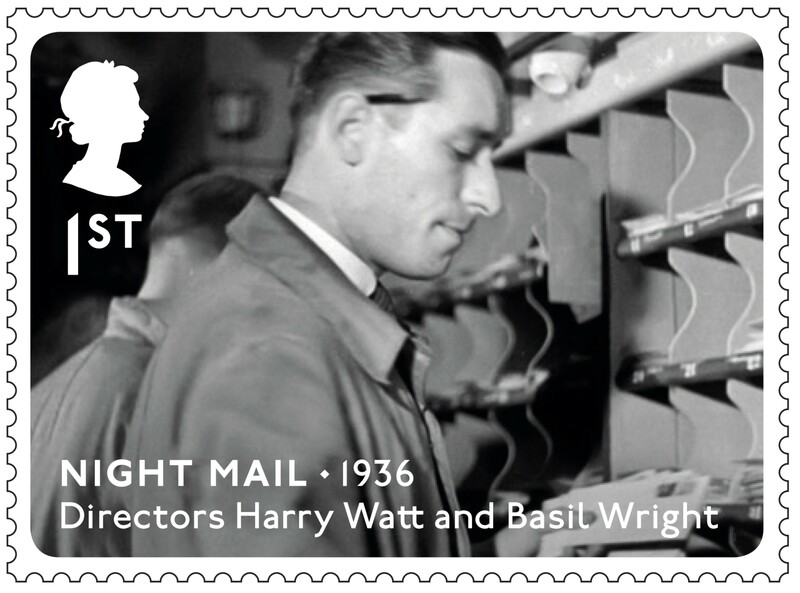 The Post Office as an employer has always made a concerted effort to advance employment opportunities for disabled people, including veterans, as has been shown in previous posts and this was particularly so after the Second World War. Hands like this were in use from the 1950s through to the 1970s – this example bears its date on it ‘4/11/64’ – and were designed to hold letters. What is particularly revolutionary about this object though is that it has a roller, or wheel, under the thumb which allowed one letter to be removed while still keeping grasp of the others. This enabled disabled employees to sort letters with greater ease and efficiency than with the previous, more basic, prosthetics. Feeling the hand it is quite heavy and it has made me think what it would have been like to use. This object was kindly donated to us from the Limb Fitting Centre at the Queen Mary’s Hospital in Roehampton, which was founded to care for soldiers wounded in the First World War, and has since become renowned as a limb fitting and amputee rehabilitation centre. 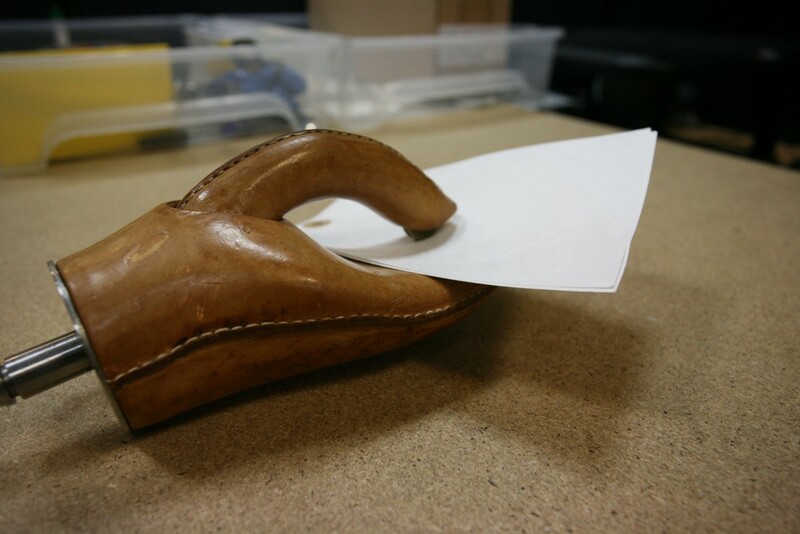 They were able to tell us that the hand had been developed by Hugh Steeper Ltd, major manufacturers of prosthetics at the time. This was the only remaining postman’s hand at Roehampton and it was returned to them by a retiring postman in the early 1970s. As you can see the BPMA’s collection is constantly developing and this object adds to our knowledge of an important part of our history which is relatively under-represented. It is fascinating objects such as this that will form the bedrock of the new Postal Museum but they are nothing without the stories of the people who used them. 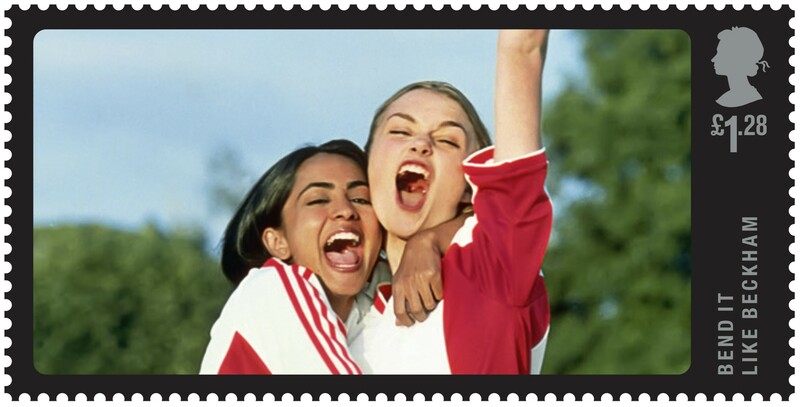 If you have a story to share please email us at peoplespost@postalheritage.org.uk and help us achieve our ambition of filling our brand new museum with the voices of real people. Thank you! Each month we are sharing what a typical day is like across the BPMA through our Meet the Staff series. 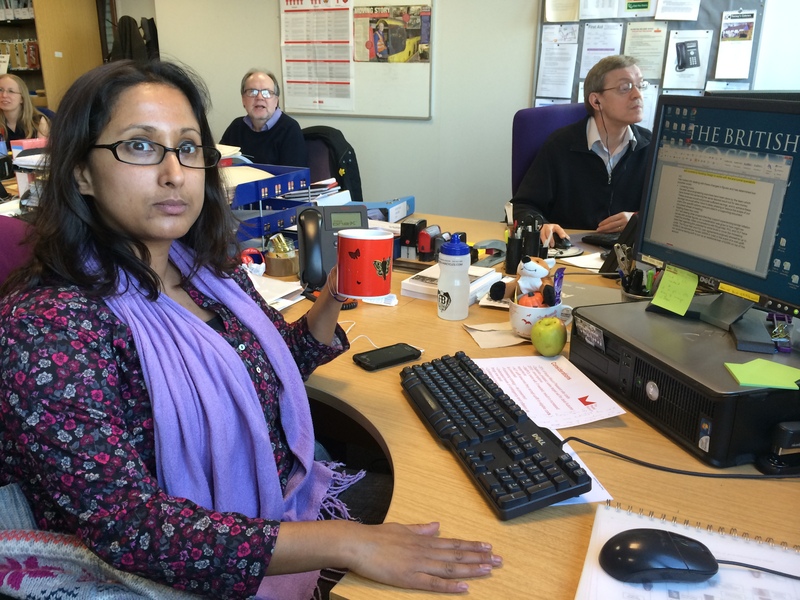 This month our Team Support Officer Deepa stepped up to the challenge. I am Deepa of House Admin and Central Functions; BPMA Team Support Officer, First of Her Role, Reporter of Facilities Issues, Coverer of Maternal Leave, Scanner of A4 Documents, and Assistor to all BPMA departments who require a hand. I’m very lucky to have a fantastically varied job that involves working with most of my colleagues in their various departments at some point. Working at my desk with an essential cup of tea in hand. My day-to-day work covers a range of semi-regular activities- logging call outs with the Royal Mail Helpdesk whenever things need fixing around our two London locations and letting people know that help will be with them shortly, requesting access to the Mail Rail tunnels for colleagues to get up to all manner of exciting subterranean activities, gathering and distributing paperwork for our Senior Management Team ahead of their fortnightly meetings and arranging their annual away days, and trying to not kill the Director’s plant on my windowsill despite its complete lack of a will to live (why does it keep flowering when it’s clearly half dead?) 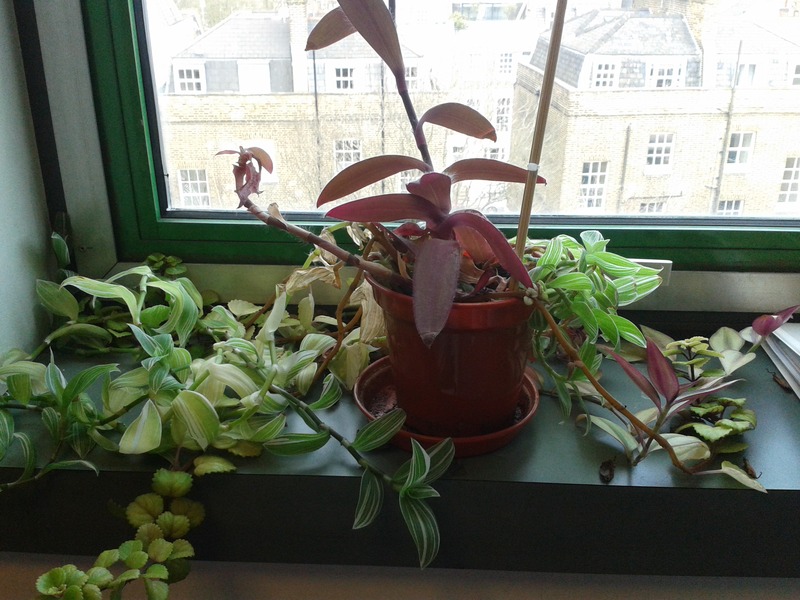 – that I tend to from the ergonomic comfort of my desk in North Islington. As our Secretary to the Trustees is currently off tending to her new addition I am also helping out by covering these duties while she’s away. 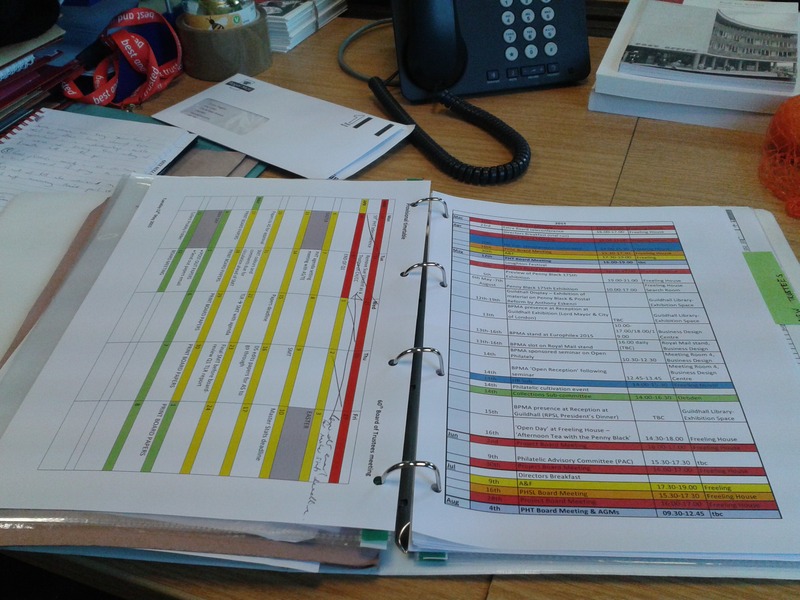 The quarterly board meetings tend to require preparation to start at least a month in advance, and then can be supplemented with additional meetings in between so there’s always something to do from scheduling meetings between staff and trustees, to preparing, printing and posting reports for them ahead of meetings, then writing them up in a (hopefully) timely manner. Last month we introduced you to Thomas May, a member of the Post Office Rifles (PORs), who fought in the First World War 100 years ago. Thomas’ diary is in BPMA’s collection and through it we can gain an insight into his personal experience of the war during his station in France in 1915. Histories of the First World War tend to focus on the action: the battles, the excitement and, of course, the horrors. However, there was another side, one full of parades, drills, inspections and endless marching. This daily drudgery is more than apparent throughout Thomas’ diary and will be the focus of today’s blog. 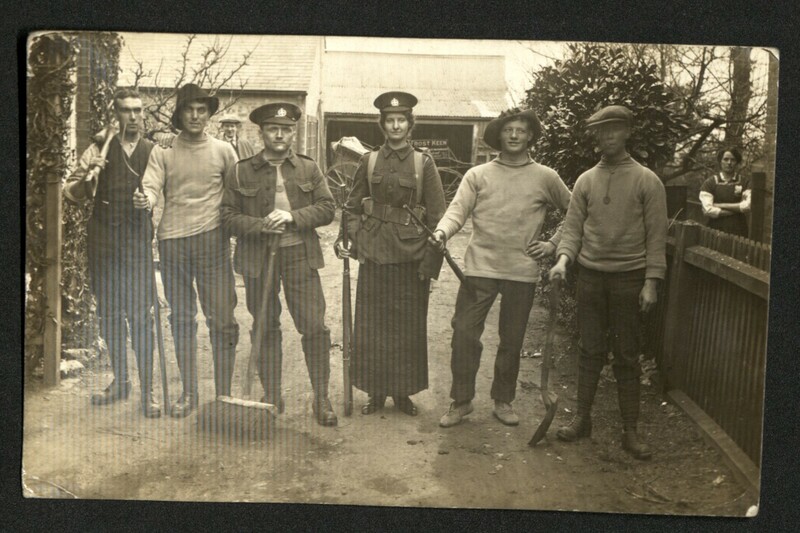 Photograph of six people holding brooms and rifles. Post Office Rifles changed into this when they were cleaning their uniform. Thomas May is third from left. Troops generally worked to a pattern of two days at ‘the front line’ in the trenches and two days at rest, in Thomas’ case usually in Bethune, a French mining town. These rest days were by no means peaceful however. Rising at 6am Thomas would frequently have to prepare kit and weapons for inspections. On Sunday 18 May, after the men had been in France for over a month, Thomas notes that it was the ‘first time I have ever paraded with rifle’. Two days later his morning consisted of ‘Rifle, Ammunition Inspection, Bayonet fighting exercises’. This is a stark reminder not only of the realities of warfare 100 years ago – where hand to hand combat was still a distinct possibility – but also of the relative inexperience of these young men. Whilst marching is the most common of any army exercise, as Thomas shows it could be tiring work, particularly in the hot French weather which these English men were far from used to. Hygiene was an important concern as these muddy, dirty conditions at the front meant fleas and lice were common, as well as more serious illnesses. Some of the billets also left something to be desired. On 23 April Thomas was billeted in ‘a dirty old barn. Inside the barn was rats, mice, chickens, ducks and one bull, but all the boys slept soundly’. Thomas does not seem to have relished the opportunities for a bath however: ‘Paraded 5.50am for Bathing much to our disgust’. Extracts such as this from the personal diaries of those who experienced the war first hand support the themes that came through the printed media of the time. A famous postcard designed for the officers and soldiers of the 4th Division was entitled ‘Fighting Fleas in Flanders’. Daily life at the front was full of such frustrations and the dichotomy of being ready to spring into action at a moment’ s notice and waiting in this state for hours on end is a powerful one. Thomas’ subtle wit can be seen throughout the diary as on May 16 he writes ‘Since the exciting evening of May 7th had nothing else but bullied beef and biscuits also no boots and puttees off’. Bullied beef and biscuits was the staple diet for the Rifles, and although Thomas complains about it, he also realised that sometimes a bland diet was a blessing. On 29 March after one of the first shellings that the PORs experienced May writes ‘For once had a good dinner, but was spoilt owing to the horrible sight’. On 4 May dinner was accompanied by ‘Plenty of Champagne because of leaving for trenches’ May tellingly puts in brackets after this ‘(Usual Occurrence)’. Alcohol was often used to try and lift morale and create cohesion between the men of the fighting unit as well as aid in the transition between extreme fighting situations and the ‘rest’ days. In contrast to the front, there were concerns back at home that alcohol was harming the productivity of war workers and thus the war effort. These were some of the components that made up the daily life of Thomas May and his fellow Post Office Rifles while at the Front. It was often frustrating, boring and tiring yet, as we will see in the next blog, the preparation was vital if the Post Office Rifles were to be successful in their first major offensive, that of the Battle of Festubert in May 1915. 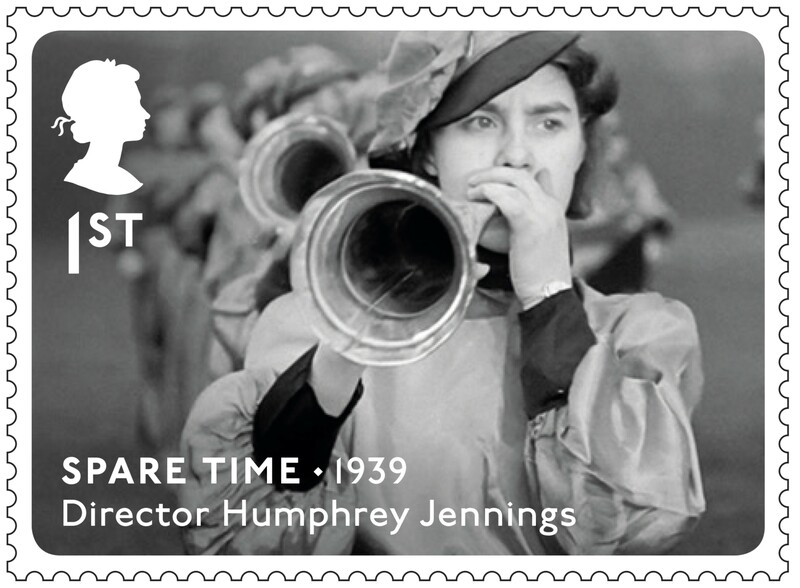 A new stamp issue celebrates six key British movies produced since the Second World War, with the accompanying Miniature Sheet focusing on the work of the General Post Office (GPO) Film Unit, which produced ground-breaking documentaries for the General Post Office in the 1930s. 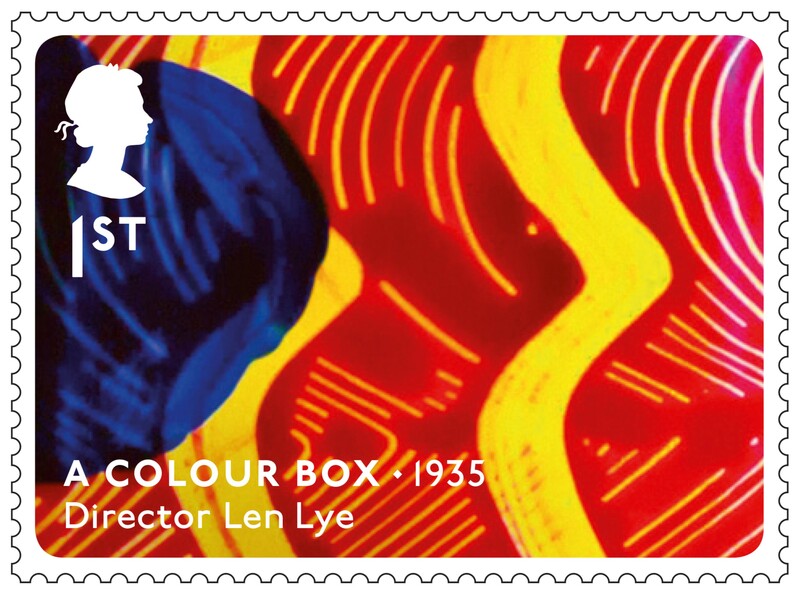 In the 1930s the GPO Film Unit produced several films, regarded as documentaries. The unit was established initially to explain postal and telephone services, and heighten the reputation of the Post Office, in an era when it was leading the world in technological innovation. 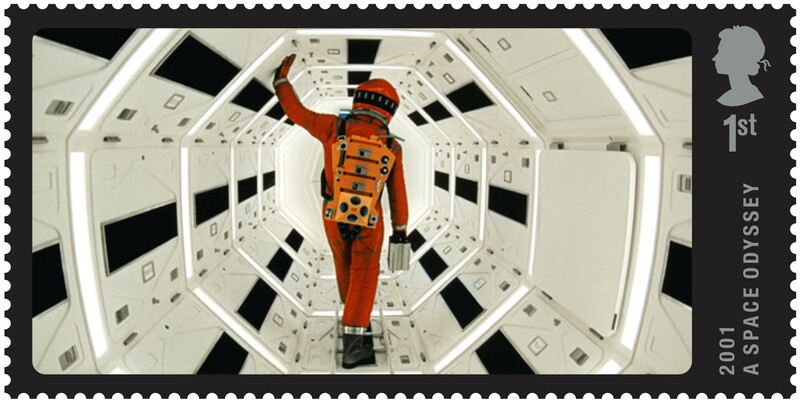 This Miniature Sheet celebrates four of the most well-known films. 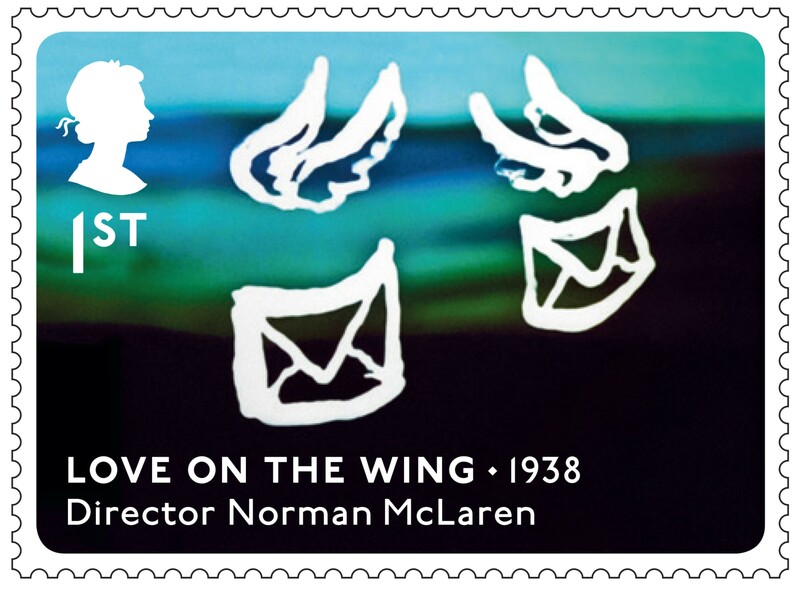 The immortal Night Mail film is marked with a stamp for the first time, and a stamp for Love on the Wing, a film by director Norman McLaren also marks his centenary in 2014. 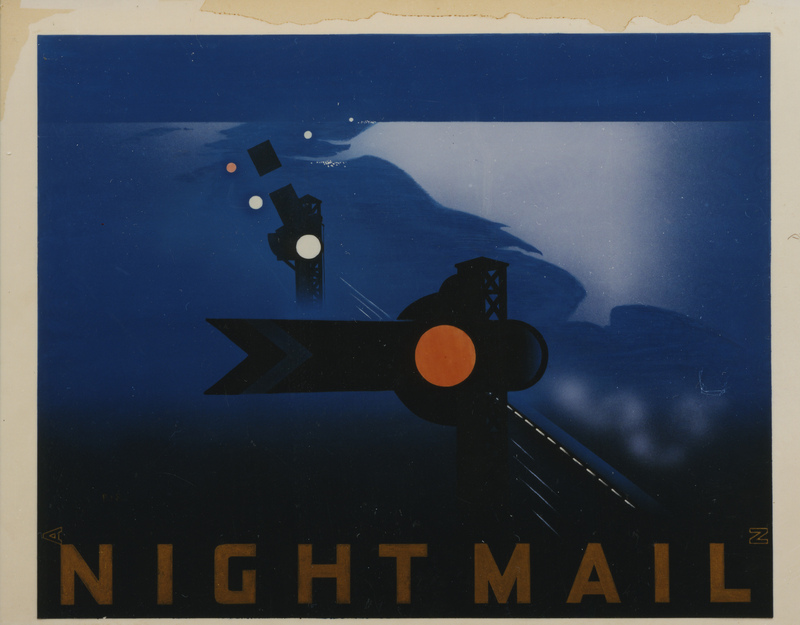 Night Mail is about a London, Midland and Scottish Railway mail train from London to Scotland. A poem by W. H. Auden was written for it, used in the closing few minutes, as was music by Benjamin Britten. 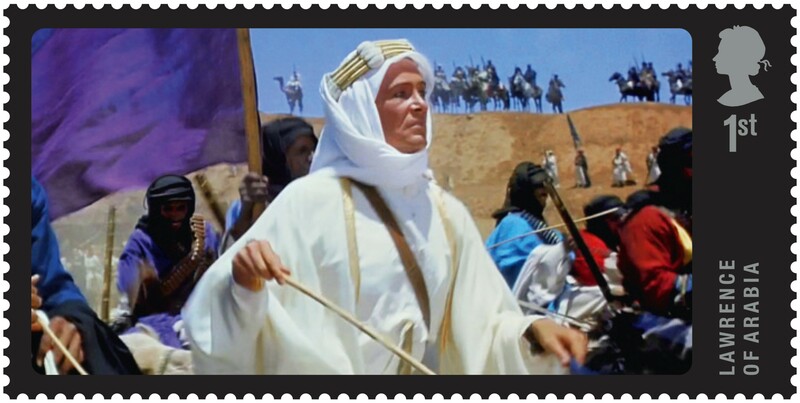 Our archive holds the original poster artwork for Night Mail as well as many others. 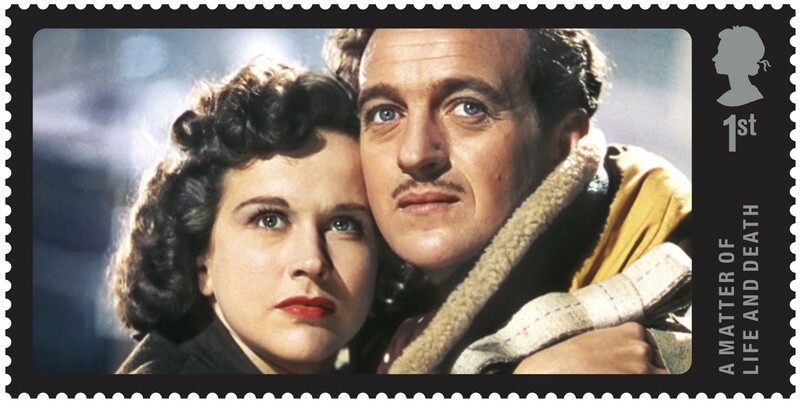 The Great British Film stamps are available from 13 May online at www.royalmail.com/personal/stamps-collectibles-gifts, by phone on 08457 641 641 and and in 10,000 Post Offices throughout the UK. Over the next year, our Philatelic and Digital teams will be working with UCL’s Mona Hess, Research Associate and PhD candidate at UCL, to digitise objects from our collections, including printing dies, rollers and plates. These objects are difficult to photograph and not available for consultation by the public. This project, funded by Share Academy, will provide access to these important objects through a combination of a number of technologies. The final output will be set of 3D digital objects for use by philatelic enthusiasts, researchers and the general public. This blog will regularly update you on what is happening along the way. Mona discusses various imaging techniques and engagement outputs for the 3D objects. A stamp plate sits at the centre of the table. 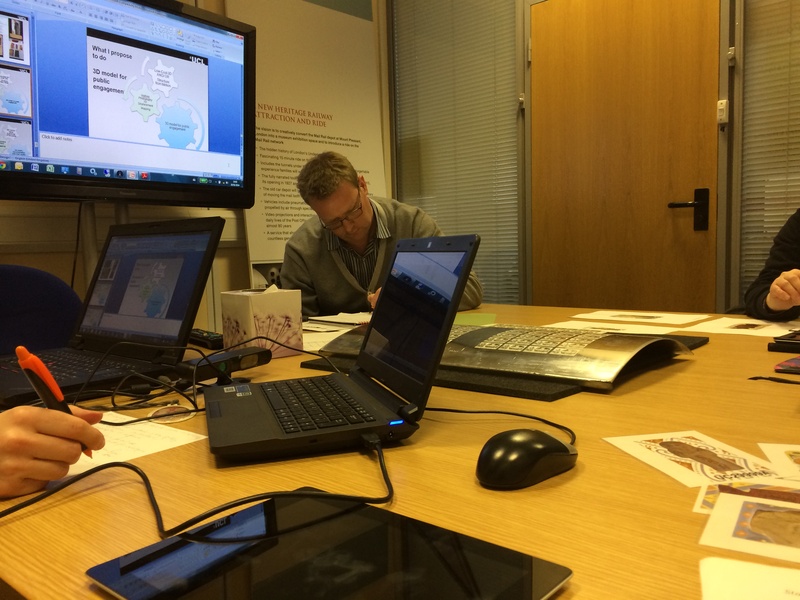 Last Friday (24 January), we held a kick-off meeting for our Philatelic 3D digitisation project, a Share Academy project partnership with UCL. Because of the highly-reflective surfaces of these objects, a combination of technologies will be trialled to see which works best. Some of the objects can be captured at the BPMA’s premises using techniques such as photogrammetry. Others, however, may need to be transported to UCL to be digitised with their large-format 3D scanning device. 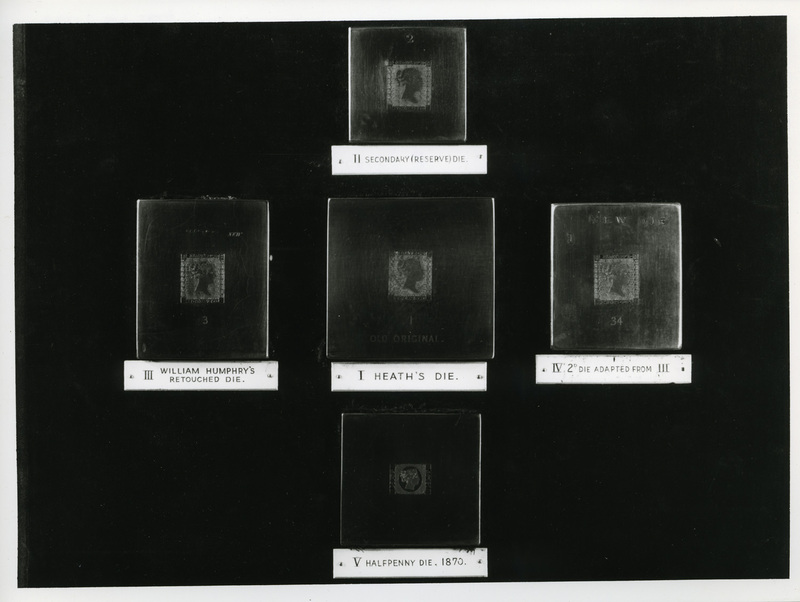 Original Heath die of Penny Black (centre) with various other dies. (POST 118/1733). The reflective and finely-engraved surface makes them difficult to photograph. Another highlight of the meeting was the demonstration of a possible output for the 3D objects: a mobile/tablet application. The Petrie Museum engages visitors using an application that explores the history of the Nile Valley with 3D digitised objects that can be manipulated by users. 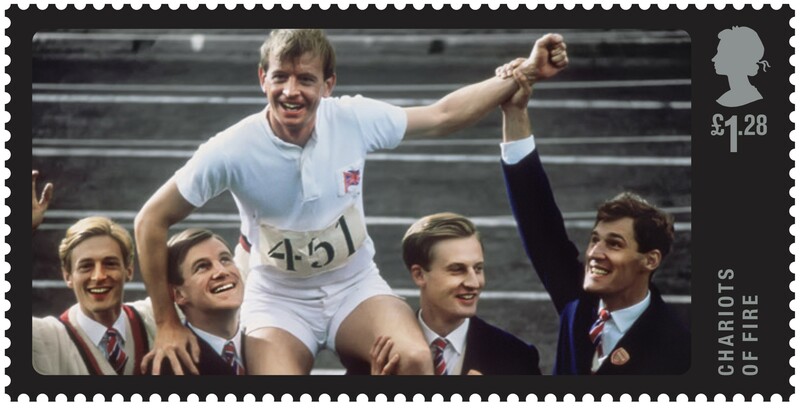 Over the next month, our Philatelic team will be selecting various objects to be captured in the trials (due to take place from March), as well as planning any transportation of objects, where necessary, to UCL. Are there any particular objects in the Philatelic collection that you want to see as 3D objects?